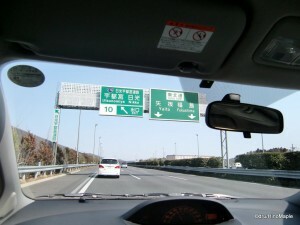 In February 2009, I had my second experience on the Tohoku Expressway, and my first driving experience in Japan. It was a vastly different experience compared to the first time I was on this expressway. This time, I was in a temperature controlled car with navigation and ETC. Words cannot describe the differences in my experience. For this trip, I went from Shinjuku, in Tokyo, to Nikko. It’s about a 160km drive. I decided to rent a car from a rental company near my apartment. In front of the rental company, I tried to set the navigation system to take me to Nikko. Unfortunately, they showed me five different routes and none of them were quick, or the best route. I ended up heading to the Shuto Expressway, Tokyo’s Expressway system, on my own as I knew how to get there. 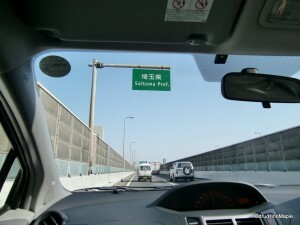 The nearest Shuto entrance was for the Yamate Tunnel, which is the fastest way to get to the Tohoku Expressway. It is a brand new section of the Shuto, so the tunnel itself is still very clean, and very bright. Once the tunnel ended, I had to face my first challenge in navigating the Shuto’s confusing system, a small junction to head a little east. To give you a better idea, the Shuto is a series of “C” roads that run around Tokyo. There are various connecting highways to go from the inner circle to the outer circles. This was also my first experience to test the car’s navigation system. Thankfully, the system knew the roads in this area and helped me find my way to reach the Tohoku Expressway. The rest of my journey to Nikko was very simple and easy. I made a side trip to Utsunomiya as well, and the navigation system worked flawlessly to get me to my destination. However, navigating the streets can be nerve wrecking as you have to consider your actions as others on the road may or may not be patient with you. Using the navigation system in Japan is both a blessing and a curse. If you can’t read, write, or understand Japanese to some extent, you will be in a lot of trouble. Obviously, in Japan, they don’t need English navigation systems as most foreigners take the train. However, driving is sometimes fun and very enjoyable. It is very important to at least have a Japanese native, who is capable of using the navigation system to help you. Along the way, the system would give audible warnings of where to go, what lane to be in, and about toll booths that were coming up. It made driving very simple and the audio prompts weren’t too intrusive. With the navigation screen being in the dashboard, it wasn’t blocking my view as other portable systems do. The only problem that occurred was passing through city limits, as the system would update me to tell me when I reached a new area. This was okay, but sometimes the highway would cross in and out of an area and I’d get a few prompts. Definitely not something I would care to hear often, but it was a nice addition. The other important thing to have in Japan is an ETC card. It is essential when driving on the expressways. The first reason to get it is for convenience. When driving up to a toll booth, all you have to do is enter the ETC lane. When you enter the ETC lane, you just slow down to about 20kph and wait for the system to tell you, via a chime, that it recognizes your car and you can go. The second reason is for the discounts. As of this posting, weekends and national holidays are now 1000 Yen per trip, regardless of the distance. Do note that some expressways are cheaper and each expressway is owned by a different company. Travelling would probably end up being more than 1000 Yen. If you are travelling late at night, you can also save a little money. If you enter or exit the expressway after midnight, you will receive a discount. If you use the roads via the regular method, you must pay the full cost. Almost all car rental shops have ETC systems installed within their cars. The only problem is getting a card on your own. If you are a resident, this should be as difficult as getting a credit card. However, if you are only visiting, you will be out of luck as an ETC card is used like a visa card. If you are living in Japan, do your best to get one if you plan to do any driving. If you are given the option to get one with your credit card, I’d apply at the same time as you never know if you’ll be driving in the future. In the end, good luck and safe driving. 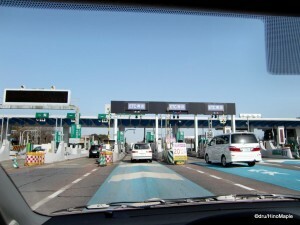 This entry was posted in Automobiles, Kanto, Tohoku and tagged car rental, driving, driving in Japan, Electronic Toll Control, ETC, ETC booth, ETC card, ETC lane, ETC system, Expressway, japan, kosoku, kosokudo, navigation, navigation system, Nikko, Nikko-shi, rent a car in Japan, Saitama, Shinjuku, Shinjuku-ku, Shuto, Shuto Expressway, Staitama-ken, Tochigi, Tochigi-ken, Tohoku, Tohoku Expressway, tokyo, Tokyo-to, Yamate Tunnel by Dru. Bookmark the permalink.